So the Oil Cleansing Method has solved most of my facial care woes. But I still get the occasional pimple. Especially around a certain time of the month, and I'm not talking about the full moon. There is also this little thing called exfoliation. Much like moisturizing, I never really did it because I thought it was only something you did if you needed to--not something that should be part of a healthy skin routine. But after I started the Oil Cleansing Method, and my skin started to clear up, I had some scars on my forehead and under my nose. It was time to begin exfoliating. But I didn't want to buy anything. This whole adulthood thing had made me cheap. 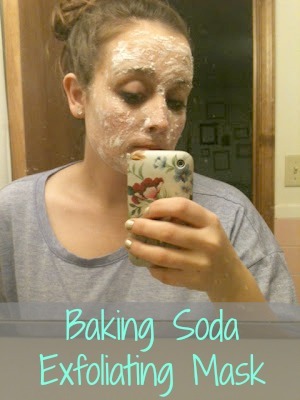 So I looked online and found a recipe for an exfoliating acne mask made of baking soda. The only ingredients were baking soda and water, which seemed easy enough, so I tried it. It was awesome. Not only did it exfoliate, but it also cleaned out my pores. I've since started using this as a spot treatment. I made a kind of big batch, and I store it in a rubber made container. 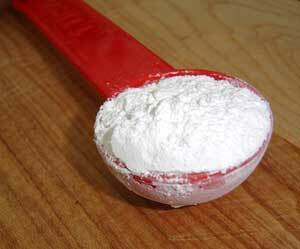 It is just one part baking soda to one part water. It will dry out a little bit as time goes by, so you can add a little bit of water as you see fit. To use it, I just apply it with my hand. It should be the consistency of a thick paste. Dave is always really grossed out when I have it on my face. And I have to say I look extremely attractive. When it starts to flake off, you know it is dry. Your face might still "feel" wet, because your pores are tingling. At this point, you need to wash it all off with warm water, paying attention to rub (therefore exfoliating) where needed, and making sure to not exfoliate in tender areas like around your eyes. This is a good (and very cheap) way to supplement your skin care. My skin is so soft, and any problem areas that I have clear up very quickly. Please let me know if anyone tries this!